Leading online games developer iSoftBet have brought the iconic film Rambo to life in the form of an exciting Internet progressive pokies machine. Starring Sylvester Stallone, Rambo tells the tale of Vietnam war veteran John Rambo, with the slot based on the final instalment in the series which was released in 2008. 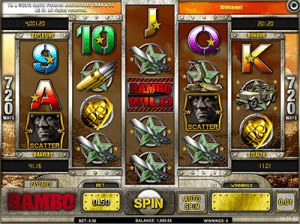 Rambo by iSoftBet is a five reel pokie featuring 720 ways to win and five progressive jackpots. The layout of the game is truly unique, with just three symbols on the first and fifth reels, four symbols on the second and fourth reels and five symbols on the centre reel. There are also a multitude of betting options to suit any player, with wagers starting at 50c for hobby gamers right through to $50 per spin for your high rollers. The game features a variety of symbols relating to the film such as a jeep, cobra, machete, bullets and your traditional 9, 10, J, Q, K and A. The jeep is the most lucrative symbol listed above, with players required to spin at least three of a kind in order to enjoy a collect. If you can land five of the jeep across the board you will be awarded with 500 coins, with the cobra paying out at 100, while the machete and bullets both pay 50 coins each. There is also a range of special symbols to watch out for, all of which can trigger more lucrative wins. Scatter symbol: Represented by the character Rambo, with three, four or five of these symbols across any of the reels resulting in five, 10 or 15 free spins with 5x, 10x or 15x of your total bet amount. When the free spins round commences, one of 10 symbols is selected at random and will extend over the entire reel which can result in additional wins. If you are lucky enough to jag three or more scatters during the free spin feature you will be awarded with extra free spins using the same extendable symbol. Wild symbol: The Rambo logo symbol is the Wild symbol and expands to cover the whole reel, giving you greater opportunity to win. The Wild Symbol substitutes for every other symbol except for the scatter and progressive jackpot symbols in order to trigger a win. The hand grenade is the symbol players should be on the lookout for if they want to land any of the four jackpots available when playing the Rambo progressive slot. The grenade is essentially another scatter and needs to appear across the reels at least five times in order to trigger a jackpot. The progressive pools on offer are names Stealth, Bravery, Honour and Explosive and pay out when you spin up five, six, seven or eight hand grenades respectively, with the Explosive Jackpot the most lucrative. The Rambo Progressive slot is available to play on your phone and mobile device free of download for iPhone and Android users. The mobile slot has been optimised to fit on the smaller screen, offering the same rough military feel as the desktop version. You can also expect the dangerous atmosphere to resonate on the mobile game, with sharp sound effects such as gunfire remaining clear despite being played through your phone’s smaller speakers. Mobile bettors won’t lose out when playing on their phone or tablet device, with the same game features and identical progressive jackpot pools available at your fingertips. If you think Rambo is the game for you, we recommend heading over to our top rated casino site, Slots Million. The casino offers the widest variety of pokie games for its players, with a range of more than 1300 available. The casino also offers a safe betting environment as well as a generous welcome bonus to help you on your winning way, with your first deposit matched up to $100 while you can also claim 100 free spins.